In North America, Volkswagen struck gold with the recent launch of the Atlas midsize SUV and the redesigned compact Tiguan, as both racking up strong sales numbers. Surfing on that wave of success, the brand also announced another SUV, the five-passenger and midsize Atlas Cross Sport, which will join the lineup this year, while a subcompact-sized model should eventually turn up on our market as well. To be honest, it’s tough to gain market share with products tailored for a specific, smaller audience. Being loyal to long-time customers is one thing, but increasing profitability is another. For those who feel like Volkswagen’s SUVs in North America are lacking a certain VW-ness, there’s the Golf Alltrack. Sure, it isn’t classified as an SUV or a crossover, but who cares, really? It has many qualities that people look for in a utility vehicle, such as all-wheel-drive, ground clearance for harsh driving conditions and plenty of cargo space. 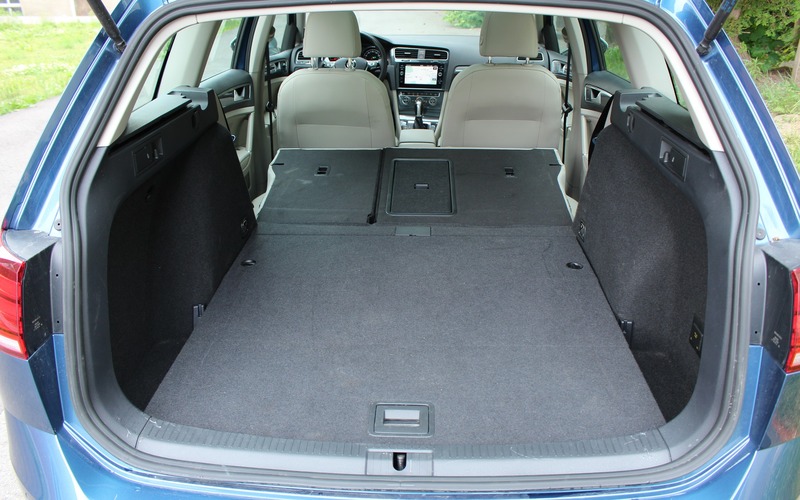 To that matter, the 2018 Volkswagen Golf Alltrack—and the Golf SportWagen on which the Alltrack is based—boasts a cargo capacity of 861 litres, or 1,883 litres with the rear seatbacks folded down. That’s almost as much as what’s found in the Volkswagen Tiguan, which grew considerably in size during its 2018 redesign. No other compact car can come close to the Golf wagon in this regard. The Alltrack makes a good impression of an SUV with its 174-mm ride height, gray body cladding and roof rails. Driving dynamics isn’t quite as sporty as with other variants of the Golf, due to the raised centre of gravity and softer suspension setup. On the other hand, the ride is more comfortable for the daily commute, especially if we’re confronted to badly-maintained city streets and pothole-riddled highways. Power comes from a turbocharged, 1.8-litre four-cylinder engine that develops 170 horsepower and 199 pound-feet of torque, and we get the choice between a six-speed manual transmission and a six-speed dual-clutch automatic. The Alltrack ain’t no GTI, obviously, but the generous torque down low means quick getaways at stoplights and a pleasant drive overall. We especially loved this engine’s fuel economy; after a sunny summer week testing the Alltrack, with about two-thirds of our total distance covered on the highway, we managed an excellent average of 7.0 L/100 km. 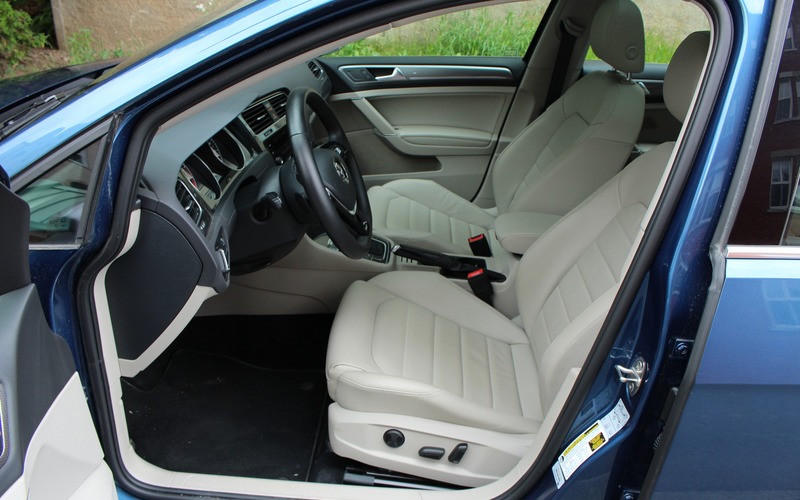 The 2018 Volkswagen Golf Alltrack also scores with supportive front seats, a fair amount of rear-seat legroom and impeccable ergonomics. Fit and finish is impressive in some places, underwhelming in others, but we appreciate upscale touches such as the fabric-lined storage bins in the doors and the solid feel of the switchgear. On the other hand, the interior design in Volkswagens doesn’t seem to have changed in more than 10 years, and some innovation here would be nice. The brand’s new I.D. family of electric vehicles should be radically different, so maybe it’s just a question of time before our wish comes true. Kudos to VW for the ease of operation of its infotainment system. The eight-inch touchscreen responds well and the main menus are quickly accessed with the surrounding buttons. There are plenty of features as well and includes Apple CarPlay as well as Android Auto integration. 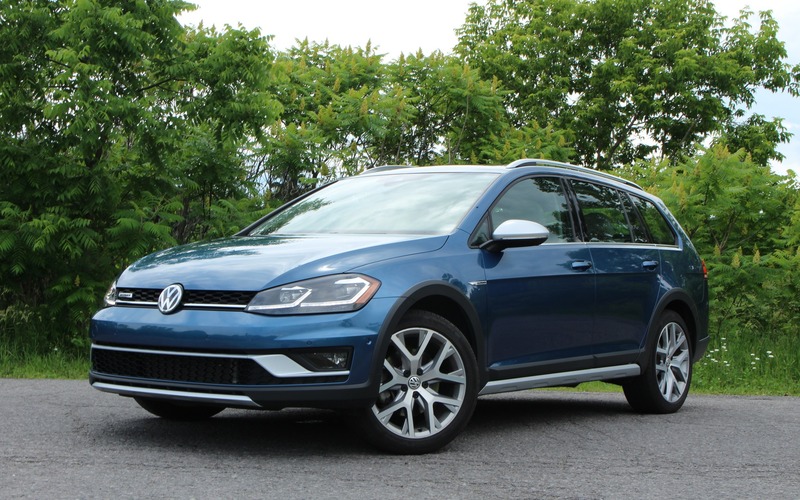 The Alltrack includes features such as 18-inch alloy wheels, heated windshield washer nozzles, an intelligent key system, SiriusXM radio compatibility, a panoramic sunroof, rain-sensing wipers, dual-zone climate control, heated front seats and leather upholstery. A Driver Assistance Package that rounds up adaptive cruise control with stop and go function, blind spot monitoring and rear cross traffic alert, forward collision alert with emergency braking and pedestrian detection as well as park assist is available, as are adaptive LED headlights. Like pretty much all versions of the Golf, there is very little to complain about here. The Alltrack is fun to drive, its 4MOTION all-wheel drivetrain is as capable as the ones in the Atlas and Tiguan, and a small family will be at ease with room to spare. But starting at $34,345 before freight and delivery charges, it doesn’t come cheap. Most buyers will likely choose the automatic transmission, rising to tab to $35,745. Actually, it’s not that the Alltrack’s price is exaggerated, as many fully loaded, compact SUVs cost about the same. But the Golf SportWagen starts at just over $24K—or less than $26K with 4MOTION all-wheel drive. Skipping the Alltrack’s jacked-up suspension and cosmetic add-ons, and we’ll save quite a bit of money. Luckily, the 2019 model will soon be hitting dealerships, and a more-affordable trim level will be added to the Alltrack, sacrificing only a couple of must-have features. Unless we can get a screaming deal on a 2018, we probably should wait for the 2019 Golf Alltrack to arrive. More importantly, the Golf Alltrack feels more like a Veedub than the Tiguan and Atlas, and for brand loyalists who still care about the drive, it may be a better choice than the brand’s “regular” SUVs. 9/10	We consumed very little fuel during our test, despite the all-wheel drivetrain. 8/10	The softer suspension enhances comfort on rough roads, and the seats very supportive. 7/10	Not a road rocket, but generous low-rpm torque makes the drive entertaining nonetheless. 8/10	Lots of features, good touchscreen response, easy to use. 8/10	Handling isn’t as sharp as in other Golf variants, but the compromise for higher ground clearance and suspension travel isn’t all that bad. 9/10	The only true wagon in its class, and the Alltrack is an excellent alternative to SUVs—even Volkswagen’s own models.